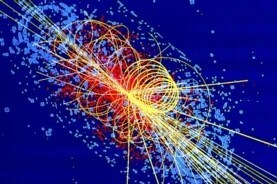 Computer simulation of particle tracks from an LHC collision that produced a Higgs boson. The stars, the planets and you and I could just as easily be made of antimatter as matter, but we are not. Something happened early in the universe’s history to give matter the upper hand, leaving a world of things built from atoms and little trace of the antimatter that was once as plentiful but is rare today. A new theory published February 11 in Physical Review Letters suggests the recently discovered Higgs boson particle may be responsible—more particularly, the Higgs field that is associated with the particle. Inflation is a theorized early epoch of the universe in which spacetime rapidly ballooned. “Inflation has a very peculiar property; it allows fields to jump around,” says study leader Alexander Kusenko of the University of California, Los Angeles. During inflation, which radically altered the universe in a span much less than a second, the Higgs field might have hopped from one value to another due to quantum fluctuations and could have gotten stuck at a very high value when inflation ended. From there it would have settled down into its lower “equilibrium” value, but while it was changing its constantly varying value could have given matter particles different masses than their antimatter counterparts. Because lighter particles require less energy to form they arise more often. Thus, if matter was lighter, it could have quickly become more plentiful. The reason the Higgs field would have had such an easy time of jumping around during inflation is that the measured mass of the Higgs boson, the particle associated with the field, is relatively low. The boson appeared in 2012 inside the Large Hadron Collider (LHC) in Switzerland, revealing its mass to be about 126 GeV (giga-electron volts), or roughly 118 times the mass of the proton. That is somewhat lighter than it could have been, according to various theories. Think of the Higgs field as a valley between two cliffs. The value of the field is akin to the elevation of the valley, and the mass of the boson determines the slope of the cliff walls. “If you have a very curved valley then you probably have very steep sides,” Kusenko says. “That’s what we discovered. This value tells us that the walls are not very steep—that means the Higgs field could jump around and go very far” to other valleys at higher elevations. Enqvist agrees that the Higgs could very well have started off much higher than it is today. Whether or not this caused the matter to split from antimatter is “somewhat more speculative,” he says. Such splitting would depend on the presence of a theorized particle that has gone undetected so far: a so-called heavy Majorana neutrino. Neutrinos are fundamental particles that come in three flavors (electron, muon and tau). A fourth neutrino might also exist, however, that is expected to be much heavier than the others and thus more difficult to detect (because the heavier a particle is, the more energy a collider must produce to create it). This particle would have the strange virtue of being its own antimatter partner. Instead of a matter and antimatter version of the particle, the matter and antimatter Majorana neutrinos would be one and the same. This two-faced quality would have made neutrinos into a bridge that allowed matter particles to cross over into antimatter particles and vice versa in the early universe. Quantum laws allow particles to transform into other particles for brief moments of time. Normally they are forbidden from converting between matter and antimatter. But if an antimatter particle, say, an antielectron neutrino turned into a Majorana neutrino, it would cease to know whether it was matter or antimatter and could then just as easily convert to a regular electron neutrino as turn back into its original antielectron neutrino self. And if the neutrino happened to be lighter than the antineutrino back then, because of the varying Higgs field, then the neutrino would have been a more likely outcome—potentially giving matter a leg up on antimatter. Kusenko and his colleagues also have another hope for finding additional support for their theory. The Higgs field process they envision could have created magnetic fields with particular properties that would still inhabit the universe today—and if so, they might be detectable. If found, the existence of such fields would provide evidence that the Higgs field really did decrease in value long ago. The scientists are trying to calculate just what the magnetic field properties would be and whether experiments have a plausible hope of seeing them, but the option raises the tantalizing hope that their theory could have testable consequences—and maybe a chance to solve the antimatter mystery after all.